I’m finally back from Indonesia! Though I wish I was back there slightly longer, but some of my friends were busy and my parents were nagging at me to come back to Singapore. But me being back here means more blog post. Did quite a bit of shopping since I had to be ready for Switzerland in July for university. One of my beloved things in this world is eyeliners. My friends since 15 knows I love eyeliner so they use to buy me that for my birthday. I remember getting 4 eyeliner on my 16th birthday just from my classmates. Liquid and pencil liners used to be the easiest thing, now it’s gel liners. 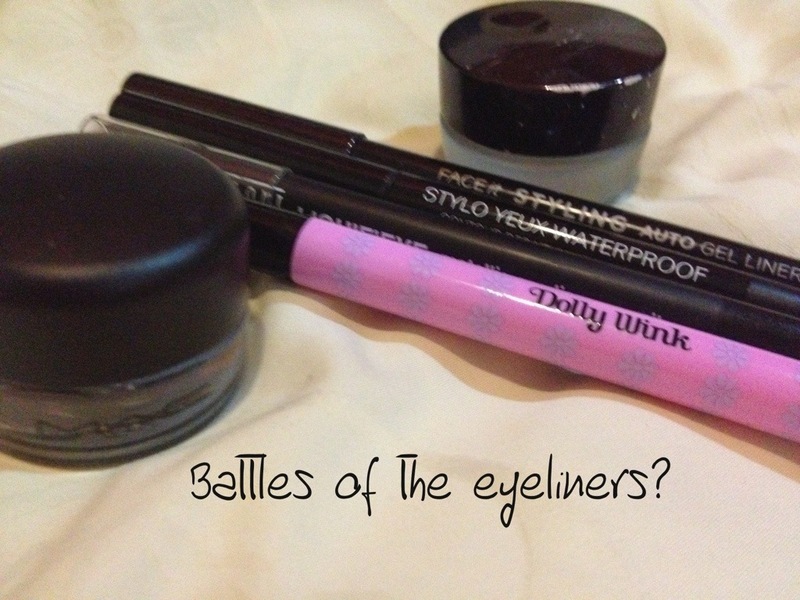 So this post is kinda my experiences with the 3 types of eyeliner and what I have now. All of these are black eyeliners by the way. My favourite out of the three since it can be used on the water line & on the lash line. The reason why i loved pencil liner is that i dont have to wait for it to set. I tried pencil liners from Lioele, which is the first eyeliner I would never recommend in my whole life since it tugged on my eye so much, Chanel, The Face Shop, and Milani. The one I find myself returning to and repurchasing the most is Chanel’s Stylo Yeux waterproof, since I started using it in late 2011, this pencil liner have been purchased now my 4th pencil. It is an automatic pencil with a sharpener on the back, which is handy since a sharpener isn’t needed during travels. The consistency of the kohl is pretty soft and it glides on my waterline without tugging my eyes. Being pencil liners, it does smudge after a few hours. The price of course isn’t that affordable, but an alternative I have tried is the Face Shop Face It Styling Auto Gel Liner. I first fell in love with its pot gel version, which I still love. It’s cheaper in comparison to the Chanel one, almost half price, and have similar packaging but slightly longer then the Chanel one. The only problem I have with this is the formula dries out really fast, just like the gel liner which I will explain below. If The Face Shop isn’t available at your area, the Milani Liquifeye should do. I am in love with its formula. It’s super super creamy and is slightly darker then the Chanel Liner, which is heavenly although it can be a little to creamy sometimes In such humid weather. Staying power is great on both waterline and lash line. My complains is that it isn’t available in Asia and it has to be bought online, and I have to have a sharpener ready. I have used up 2 The Faceshop gel liner and currently using MAC’s blacktrack fluid line, and purchased Stilla’s smudge pot since Sephora is on sale. The Faceshop gel liner was my first gel liner, and I still love it although it dries up in the pot rather quickly, just like the pencil. It’s cheaper & readily available in Asia for its dark pay out, but I haven’t been able to enjoy the whole pot due to its drying consistency. MAC blacktrack fluid line is a lot more creamier but as compared to the face shop, it lacks in pigmentation. The brush I love using is Benefits slanted eyeliner brush. Never really loved them. I tried Lancôme ‘s a few years back, which converted me to pencil lovers instead. But when I was in Jakarta, I purchased Dolly Wink’s black liquid liner. I must say its really fool proof, but I still need practice since it doesn’t give me as much control as a angled brush does. I loved it over a gel liner since it gives it more pigmentation. Liquid liners really irks me since I have to be patient for it to set, but the impatient me blinks my eyes right after I apply eyeliner so liquid liner isn’t my type although it last longer generally. I currently have finished Chanel Stylo Yeux Waterproof in Ebene, The Faceshop pencil & gel liner. The only one I would repurchased is the Chanel liner since the consistency of the liner & the packaging size is of my taste. I will repurchase the gel liner from the face shop, like always. Although I hope they would change slightly the formula. I wanna thank you for publicing this awesome information. Keep up the great job. I’ll subscribe to your weblog also. thnx!